As a boutique frame shop located in San Diego, California, our team at FRAMECO’s Quality Custom Wholesale Framing is an intimate group of framers and designers with a common goal to produce the best quality work, fast turnaround and offer the most competitive pricing in the industry. 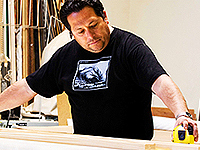 Carlos Rivera has been an Art Framer for 30 years in Southern California. Carlos started FRAMECO in 2011 after the closing of Tony’s Custom Framing, where he worked for 16 years as a primary framer. Carlos can fabricate almost anything that you can imagine, working with digital imaging printers, photographers, artists, hospitality, healthcare, model homes and customized residential work. Carlos previously worked with the Museum of Contemporary Art in Los Angeles and the Wayne Gretzky’s personal collection.